Modern health and personal care are at a crossroads. Many of the ‘established’ truths are being challenged and receiving a critical re-examination. Many of the ‘weapons’, such as antibiotics, used against the conditions afflicting man, have lost their effectiveness. Many conditions and diseases that were believed eliminated or at the very least brought under control are re-emerging, often in worst forms and with greater virulence. Many are becoming resistant to our best ‘weapons’. This necessitates the use of ever-stronger medicines, drugs and other treatments to control what were often only simple conditions requiring simple solutions. Antibiotic resistance is a case in point. Brought about by inappropriate, indiscriminate, often irresponsible use and overconfidence in the infallibility of modern medicine and science. Modern science and medicine too often dismiss old remedies as mere superstitions, which are kept alive by ignorance. Faced with a near crisis however, there is a renewed focus among health and personal care professionals from many disciplines on these alternatives. The ‘traditional’ natural, botanical, holistic aids and treatments are becoming respectable and accepted in the scientific and advanced medical community. At Nancy K. Brown we strive to provide you with the best of both worlds. We combine the traditional with modern scientific breakthroughs. We select the best both approaches have to offer. No other single ingredient fulfills this role better than Aloe Vera. A powerful all natural botanical, brimming with minerals, vitamins, enzymes and amino acids, Aloe Vera is the very foundation of the Nancy K. Brown skin, body, hand and foot care program and products. Almost all of Nancy K. Brown’s skin, body, han and foot care products, from the basics to the specialized treatments, have this wonderful botanical as their base. No other ingredient has more therapeutic value for all skin types, conditions and concerns, whether you are looking for preventive or corrective care products and services. Nancy K. Brown’s Aloe Vera is unique in the beauty industry. 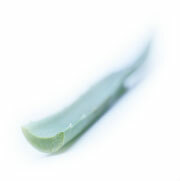 Our Aloe Vera is made from the whole leaf and cold processed, providing you with maximum potency. Aloe Vera, what is it? What beneficial components does Aloe Vera contain? Why Aloe Vera is better than just Aloe? Why Aloe Vera in skin, body, hand and foot care products? Why Nancy K. Brown Aloe Vera? What is the real color of Aloe Vera?